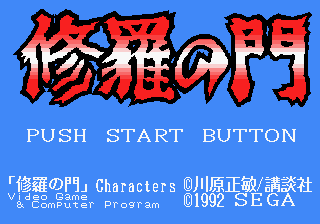 Shura no Mon (修羅の門) is a 1992 strategic fighting game by Sega for the Sega Mega Drive based around Kodansha's Shura no Mon manga. The game is a menu-driven fighting game. You can move around the field while a meter on the left side of the screen rises — this shows your attack charge level. Once your attack is powerful enough, hit to open a menu of attacks, which you navigate to make an attack. and do something; exactly what is unknown (TODO). Main article: Shura no Mon/Magazine articles.